Screenplay: Jon Ronson, Peter Straughan. Starring: Michael Fassbender, Domhnall Gleeson, Maggie Gyllenhaal, Scoot McNairy, Francois Civil, Carla Azar, Tess Harper. With the exception of Matthew McConaughey and his outstandingly brave career choices of late, there are few actors who have been as consistent or interesting to watch as Michael Fassbender. After the much (and unfairly) maligned The Counselor and a thoroughly deserved Oscar nomination for 12 Years a Slave, Fassbender’s decision to pop on a papier-mâché head and remain unseen for almost the entirety of an independent, oddball comedy is certainly an interesting choice. However, it’s a good one and proves that his ability to spot a unique and worthwhile project is thoroughly intact. Jon Burroughs (Domhnall Gleeson) is a young aspiring musician who luckily gets a chance to play keyboard with US band The Soronprfbs led by frontman Frank (Michael Fassbender). However, Frank is a very mysterious and enigmatic person and Jon finds himself involved in something he doesn’t fully understand. Many viewers will probably be unaware of director Lenny Abrahamson but those in the the know will no doubt be aware of his unseen little Irish gem Adam & Paul. If not, I implore you to check it out. It’s a marvellously offbeat tragicomedy that shares many of it’s themes with Frank and shows that Abrahamson has a knack for eccentric and original filmmaking. Much like Adam & Paul, the characters of Frank are social misfits, living on the periphery of the norm and struggling to connect in a world that’s not very inviting to them. 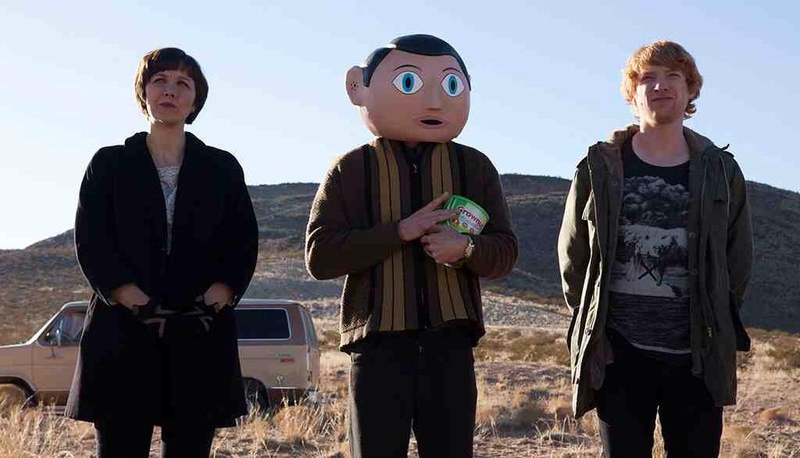 As well as the array of eccentric oddballs on display, the beauty and enjoyment of the film lies in the mystery of it’s titular character and even though Fassbender is masked under a massive, papier-mâché bonce, he still manages to bring humour and an intriguing depth to the role and leaves you questioning whether Frank is a non-conformist musical genius or a fragile, would-be artist with mental health problems. In juggling the psyche of this man, we are treated to a film with genuinely hilarious moments coupled with some finely balanced pathos. Rounding out the cast of delightful oddities we have strong performances across the board: Domhnall (son of Brendan) Gleeson yet again proves his worth in an ever increasing list of good roles while Scoot McNairy and, the always excellent, Maggie Gyllenhaal deliver yet more welcome eccentricity amidst the mayhem. The film works primarily on these appealing characters, their idiosyncrasies and differing emotional angst and still manages to make a commentary on the nature of art and the integrity of an artist. With the shifts in tone and off-beat wackiness some may be left just as unsure about the film as they would be about pronouncing “The Soronprfbs” – the name of the avant-garde rock band at the films centre. However, with an open mind many will appreciate the sharp writing, excellent performances and the finely tuned balance of black humour. After this charming and engaging little dramedy, I wouldn’t be surprised if all the cast and crew developed a big head. Fine work by everyone. 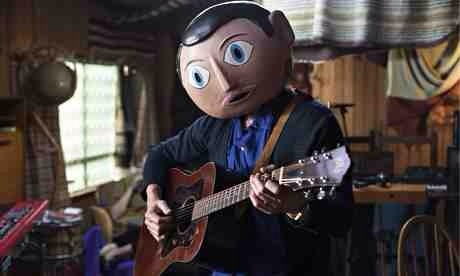 Trivia: Frank is loosely based on late British comedian Chris Sievey’s iconic comedy character Frank Sidebottom who wore the same papier-mached head. Screenwriter Jon Ronson once played in his band. This entry was posted on November 18, 2014 at 2:35 pm and is filed under Comedy, Drama with tags 2014. You can follow any responses to this entry through the RSS 2.0 feed. You can leave a response, or trackback from your own site. I never had a chance to see this when it came out but I wanted to see if only for Fassbender. 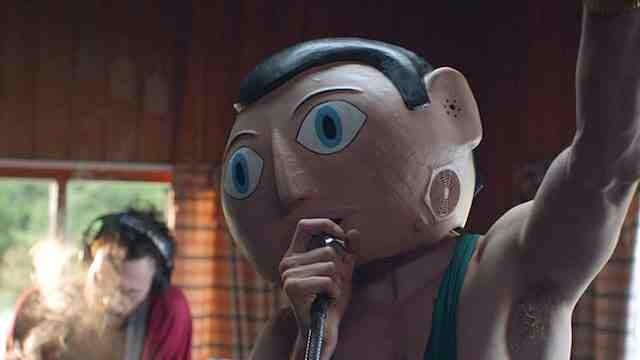 It’s always good to see a character driven dramedy (the smaller ones like Frank seem to get pushed to the side a lot). Great review! Lovely review, Mark. I’m happy to hear that you liked this one so much. I wasn’t sure how I felt about it until it’s final moments, and then, everything sort of clicked into place for me. I agree, the tone of the film is all over the place, but it’s still somehow in control. Fine work by all indeed. Cheers Alex. Glad to hear from another fan of this. Totally agree that the ending brought it all beautifully together and that final song where they collaborate was just superb. A thoroughly enjoyable little flick. Thanks Chris! Fassbender is, without doubt, one of the interesting actors around just now. He’s really on fire and most films he’s in are just gold, man. This was a real highlight for me and a very brave choice! Nice review. Glad you liked it, I loved this film. Thanks Laura. I loved it too but then I always seem to like films of this type. Such a quirky little treat. Haha! Yeah, “Mucker”. He always seems to put the plural in, though. It basically means “friend” or “mate” and seems to have stuck when it comes to us. Superb stuff sir and so glad you liked it. This is possibly my favourite film of the year so far. It was utterly bonkers but it had some nice heartfelt stuff in there too. Bonkers indeed, mate. But still great. I can see why you’d rate it as your favourite of the year. There’s a good chance it’ll make my “best of 2014” list. Fabulous little film and Fassbender can seemingly do no wrong these days. I’ve been reading so much great stuff about this and I have never been able to make up my mind! Maybe if I come across it I should just check it out. Cheers Zoe! If you do come across this, I highly recommend it. It’s fair to say that it’s not for everyone but you really need to try it to find out for sure. What I loved was the opening of the movie how it showed that anything can inspire a writer. It was a strange movie, but I quite enjoyed it. I loved it from beginning to end, Nostra (particularly how it ended). There’s no doubt that it’s an odd movie but I thought it balanced it’s themes and tones very well. Cheers my man! Ah, good for you mate. One of the best of the year in my book. Just leftfield enough rather than being too up its own arse. A genuine pleasure. I couldn’t have put it any better, my man! It balanced it’s offbeat humour really well. However, it’s seems that across the pond they didn’t quite take to it the same way we have. I saw him with that head on, on a talk show over here. I didn’t know what to think. It just looks so wack. But after that review I’ll check it out. Its a fabulous little film, dave. For some reason you guys dont seem to have taken to it’s offbeat humour the way that the UK and Irish audiences have though. But going by your tastes, I’d still highly recommend it. Offbeat. That’s a good word for it. You know I really like Fassbender. He has the steely intensity of actors like Ralph Finnes or Daniel Day-Lewis. So for him to have a head on him the whole time just takes away his charisma for me. I like Maggie Gyllenhaal and you can see her head so there’s that. I’ll let you know what I think when I get to it. Im a massive fan of Fassbender myself and with him having this head on I also had reservations, Dave. But believe me, the film works, man. It works remarkably well. Nice review. While I enjoyed Fassbender’s performance, I couldn’t get into the movie at all. The offbeat humor got tiresome for me after a while and I found most of the characters to be too unlikeable. Cheers, man. Yeah, like I’ve mentioned earlier in the comments, Frank seems to have went down better in the UK than it has in the US. Many people over here seemed to enjoy the film a lot more. I loved it’s offbeat humour and even those the characters were a bit out there, I still enjoyed them all. I throughout this was a rare treat. You know, I also love this one! 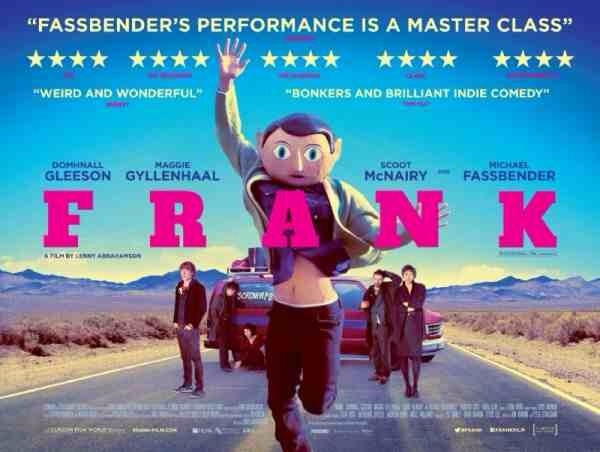 Another gem takes place in Ireland… Whether you love him or not, but, I bet nobody can ‘no love’ Fassbender here! His acting is a master meta-performance… although the movie ends up a little bit ‘unexpected’ during the third act! Love this movie, love your review, man! Thank you sir! I really enjoyed this one. A very brave turn from Fassbender here. I thought he was excellent and even though the third acts tone changed quite dramtically, I really thought it worked well. Like you say, another little gem from Ireland. I’m glad we share some similarities of the most decent this year! Great review! I didn’t love it as much as you, but I still really liked it. I do think it fell apart a little during its third act. It’s incredibly frustrating that Frank could have really been perfect if dealt with more carefully. Frank often feels as though it’s trying to be too many things rolled into one, which feels very obvious during the second half of the film. Still, I really liked it and I loved Fassbender and Gyllenhaal. I can see where you’re coming from in the third act. The tone definitely changed but I have to say, I loved it. I thought it ended very strongly and had the courage to tackle deeper issues. The issues that it only flirted with in the earlier part of the film. Fassbender nailed it too and he really came into his own in the final third! I really enjoyed this one too. 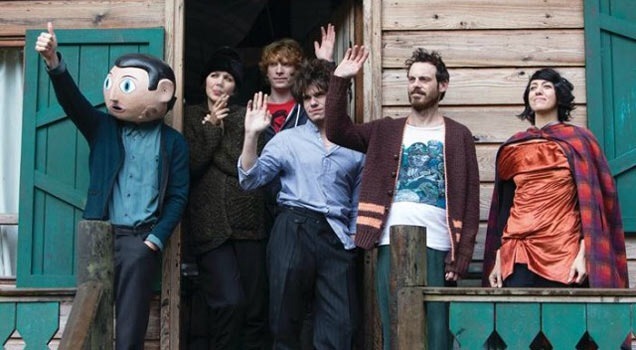 A quirky film with some great performances, particular Fassbender who does an incredible job without us seeing his face. Fassbender was magnificent wasn’t he? How do you manage to give such an appealing performance when your face is covered for almost the entirety of the film. Such a great actor! Cheers Dan!